Super Typhoon Haiyan, which slammed into the Philippines early Friday morning, is one of the strongest storms ever recorded on the planet. It has forced more than a million people to flee, and is literally blowing houses apart. Haiyan, a category-5 super typhoon, scoured the northern tip of Cebu Province and headed west towards Boracay island, both of them tourist destinations, after lashing the central islands of Leyte and Samar with 275 kph (170 mph) wind gusts and 5-6 meter (15-19 ft) waves. Three people were killed and seven injured, national disaster agency spokesman Rey Balido told a news briefing at the main army base in Manila. The death toll could rise as reports come in from stricken areas. 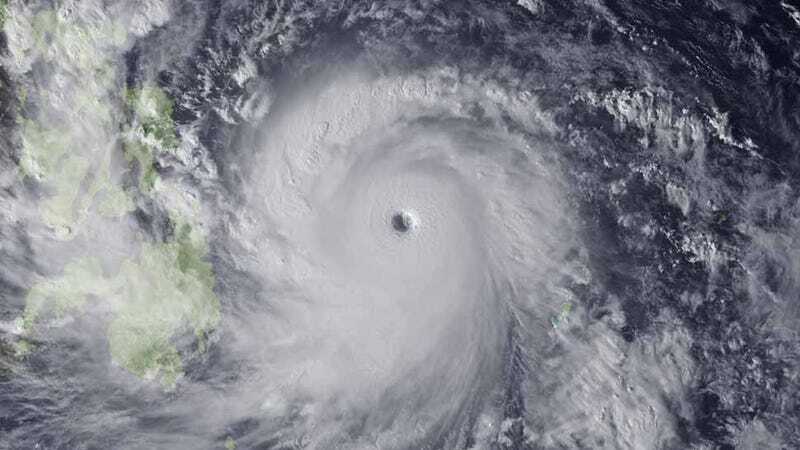 Haiyan's strength is equal to an extremely powerful Category 5 hurricane in the Atlantic. Scary stuff. Stay safe, everyone. Also, Red Cross, if you're able to help.